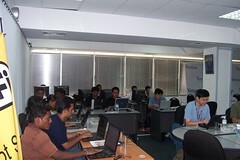 The codefest got on to a somewhat good start with people showing up pretty much on time. WHat we are stuck with now is what problems to solve. Some of the more obvious ones are ofcourse localization issues and writing an installer for Taprobane. 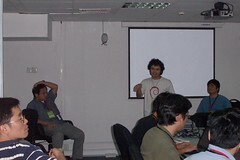 There are some renowned hackers such as NIIBE Yutaka who is a kernel hacker, Kuniyasu Suzaki who maintains the Japanese version of Debian Jr and Kazuki Ohta who works on qt-im. We killed some time in the morning setting up the machines, connecting to the Wi-Fi network and eating pizza. 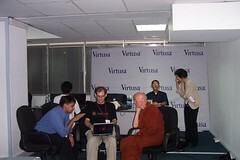 We also had a visit and a couple of interviews from ETV for the wired program. Now we have just started introducing each other. 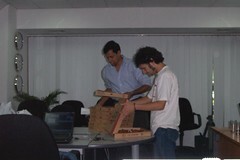 The pizza finally arrived, a bit late for the international hackers, who had already gone out for food. Oh well, that just meant we had to have more slices than usual. No one complained. 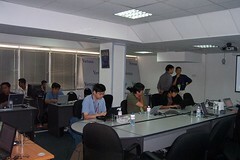 More people walked in to the codefest to checkout what these hackers were upto including the Martin Michlmayr from Debian, Asai from CICC and our very own Ven Mettavihari with a camera crew. Anuradha did a small presentation on the reasons behind building the new Taprobane distributions and what we are currently working on and future improvements. Some plans to improve the kudzu by taking the best of both discover and kudzu was mentioned as well as coming up with a light weight Taprobane version based on iceWM was discussed. 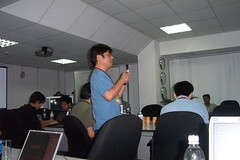 During the Q&A session, Anuradha's claim that Taprobane booted faster was put to the test by Kuniyasu Suzaki. After booting Taprobane and then the Japanese version of Knoppix Jr., Taprobane won by a minute! 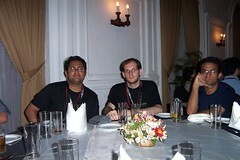 At about 7 'O clock most of hackers went to Galle Face hotel for dinner which was sponsered by the CICC. 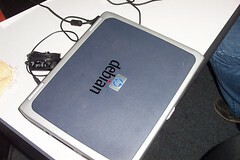 Myself and Martin had a good chat about Debian and the forces supporting and annoying it. 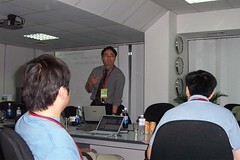 There was also several interesting chats on Coconuts and related alcholic drinks as well as banana species. Desert was quite interesting with rice pudding and other familiar courses designed as deserts. When we got back, Niibe got settled with the group porting Taprobane to the 64bit architecture using a 32bit machine (due to unavailability of a x86_64 machine) by using a cross compiler. Niibe seemed to enjoy discribing the build tool chain required inorder to cross compile as it is his area of expertise. blog. It contains WAY OUT stuff about Teeth Whitening. Hi. Interesting posts here. tooth whitening saved my confidence and rebuilt my self esteem. I also had veneers done after years spent worrying about my imperfect smile and now I am proud to show off my wonderful teeth!